Click on the, 'Free Fortune Telling' banner below. Ask your questions about the future, in complete privacy. You are not required to divulge any personal information and no information is stored. This interactive service is completely Free of Cost, but provides detailed readings. Your time and date of birth are not required. This is an online version of the PowerFortunes, Fortune Telling Cards and these predictions are based on the last of the 'Three Layouts' that allow an Enquirer to learn if a specific wish or desire will be realised in the future. Hence, frame your questions in such a manner. An Enquirer may make three attempts, until the 9♥ 'Wish Card', is drawn. If the 'Wish Card' is among the nine cards drawn, this wish will be realised in the future. The remaining eight cards in the layout, depict events that will occur in the future. The meanings of all the cards are to be read in conjunction with one another. The reading as a whole, will create a clear prediction of the immediate, to mid-term future of the Enquirer. Get your own deck of the 'PowerFortunes Fortune Telling Cards' and use all three layouts, as your guide through life's uncertainties. Remember, these card readings will not only predict your own future, but just like a real fortune teller, they will allow you to read the futures of others too. You will be pleasantly surprised by the accuracy you can achieve, when you use the cards for real. Add this Feature to your Site/Blog. Get a FREE locket talisman, 'Vashikaran' for attracting love or 'Shri Yantra', for wealth and success, with your pack of cards. Click here, for details. ⇒ How do Fortune Telling Cards Work? ⇒ Are Fortune Telling Cards for Real? 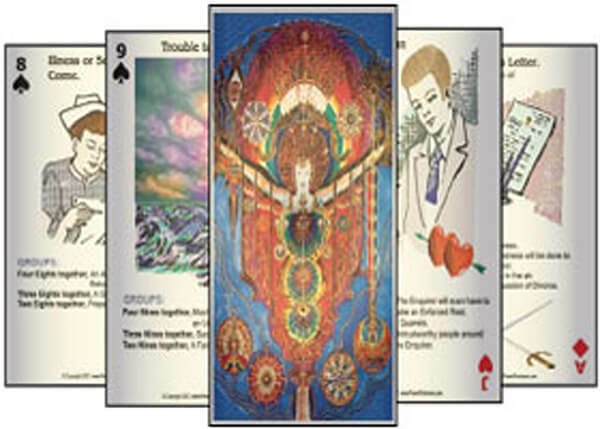 ⇒ How do these Cards differ from Tarot Cards? ⇒ What are the other Spreads?